dead Aerox battery (VRLA) looking for smart charger etc. I press the button, nothing. "NOTICE: To charge a VRLA (Valve Regulated Lead Acid) battery, a special (constant-voltage) battery charger is required. Using a conventional battery charger will damage the battery." I heard I should get a CTEK on Lazada but to be honest I don't understand why I could get a Battery Tender for 1000 baht or so but the smaller CTEK are 2500 baht. I don't need something fancy, i just need something that works and to be honest, if the battery and bike alternator works then it will be used very rarely. Have you tested the battery voltage with some wire and a bulb. About Aerox, " I've read and the keyless thing is more hassle than an actual key but I haven't ruled out the possibility that most of them are idiots and haven't read the instructions properly. " I went ahead and got me a new different branded battery, they had a multimeter and my friend said it was only showing 10.x volts, my "charger" certainly didn't do it any favor I guess. still need to figure out multimeter and small battery tender, we'll see if anyone has some recommendations for those. it was showing 12.x volt on start and went up to 14v while idle/driving. I imagine the Aerox has LED headlight, stop light etc if not maybe the high beam on and a stuck on brake light can take enough power away from the charging circuit that slowly the battery doesn't get charged enough...that can build up sulphation which then starts a vicious circle of the battery not accepting enough charge which leads to more sulphation...or you could have just had a dud battery. everything else turns off as soon as you put the peg down, lights, UI and everything. Yeah Thais love pressing the buttons on other peoples bikes. The number of times I've found full beam on, adjustable levers adjusted etc. it does my head it. If you're really stuck you can use a computer UPS, remove the battery from that and replace with your bike battery and leave it on for 24 hours. They constantly charge at a slow rate. would you reckon that a UPS is likely to work with a VRLA battery? I don't know what that means.. tried to google it but figured i'd only replace the battery instead so I bought a bigger but different branded battery for 800 baht and tried to ask them if it was VRLA too but was getting nowhere. will check the retail box tomorrow but I assume figuring out the UPS thing isn't that difficult. was too curious, went down and got the new retail box from the bike. 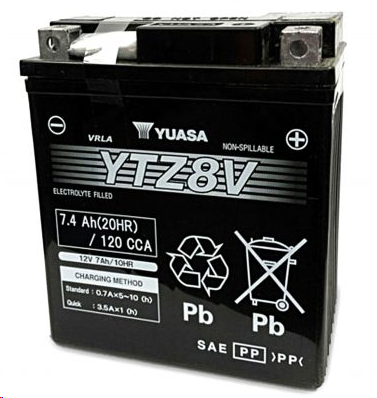 Storm Rider YTX-7L-BS 12V/7AH Maintenance Free battery. 800 baht from shop, 600 baht on shopee (without shipping), fair. update: that didn't go as planned. my old battery (which was probably already damaged) sat in there 30 minutes or so..
then the UPS started to emit a continuous beep.. didn't know what it was about so unplugged from wall and battery connectors..
so I will leave that battery alone for now, haha. Yeah I can confirm it works, I've done it 7-8 times on my Ninja 250 as it sits unridden for long periods, the battery is over 3 years old now and still works fine. Sounds like your UPS isn't charging properly (you did mention it was broken).